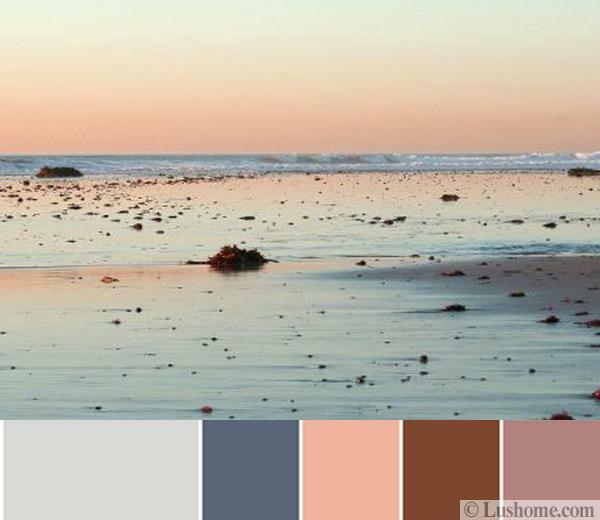 Soft peach and blue create a fascinating, inspiring and modern color scheme. 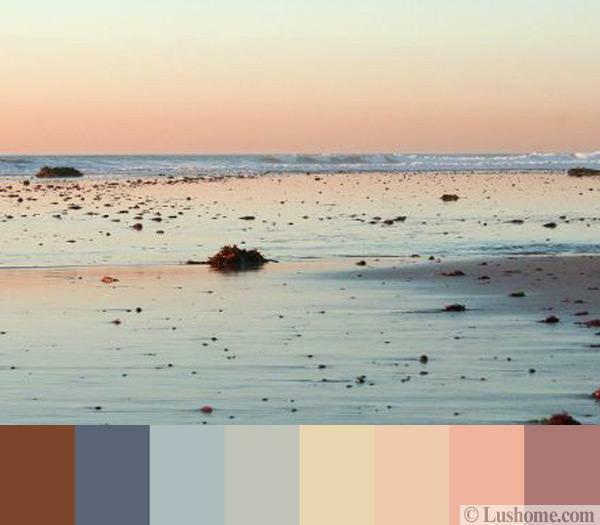 The pink and grayish blue color combinations remind of quiet beach sunsets and offer a very romantic, relaxing and beautiful interior colors for decorating. These hues work well with comfortable brown colors of natural wood, green hues of plant leaves, earthy shades, and neutral whites. Light colors are best for small rooms. 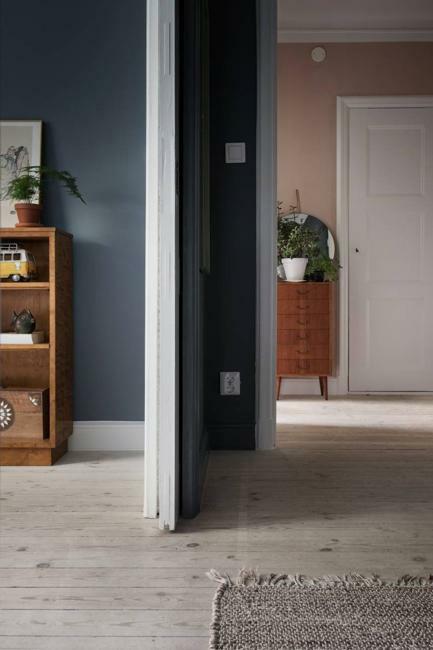 Dark tones bring elegance and style into the rooms and create attractive contrasts. Pale yellow and turquoise pastels make beautiful accents for interior decorating in peach pink and bluish gray. Analogous colors enhance the beautiful design that blue tones create with peach. A touch of yellow and light brown colors of room furniture brighten up the room with gray walls. Houseplants bring freshness into the home while harmonizing the living spaces. 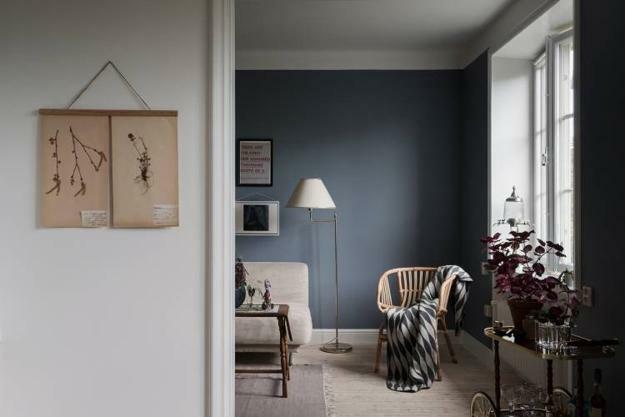 This beautiful apartment show how warm pink color can balance cool grayish blue. 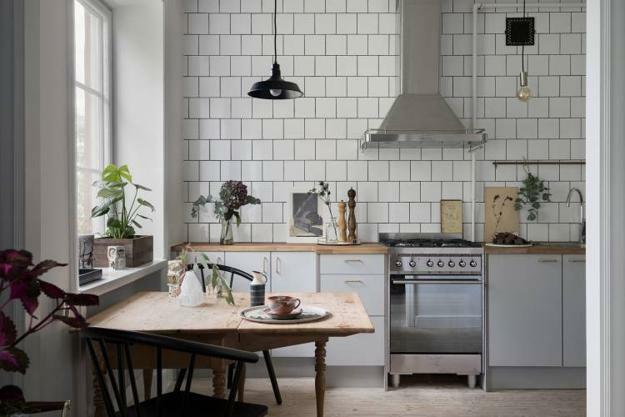 Balance and beautiful contrasts enhance the interior design in Scandinavian style. 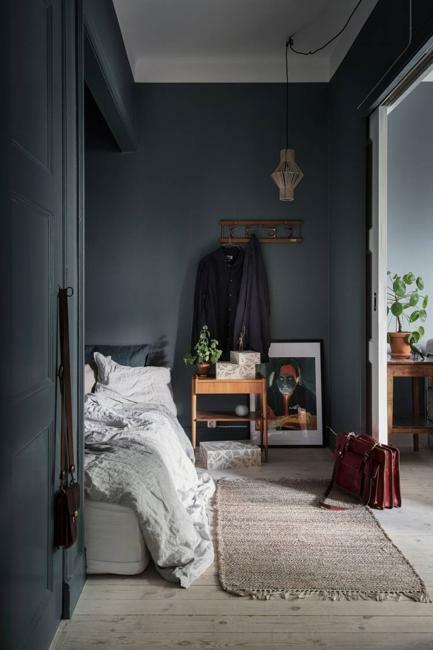 The apartment ideas by the studio Lindholm offer this attractive and comfortable color palette and elegant room decorating. 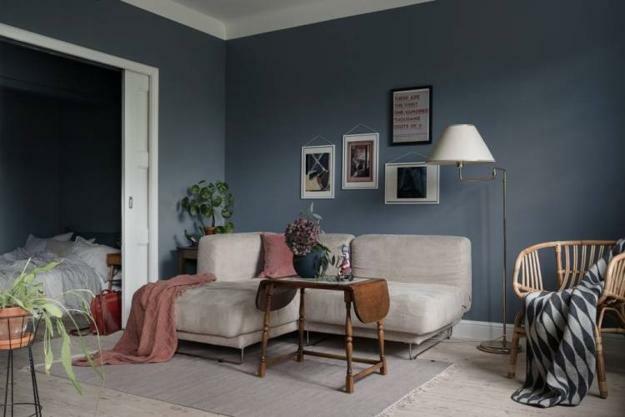 Blue-gray paint color creates modern living room and bedroom. 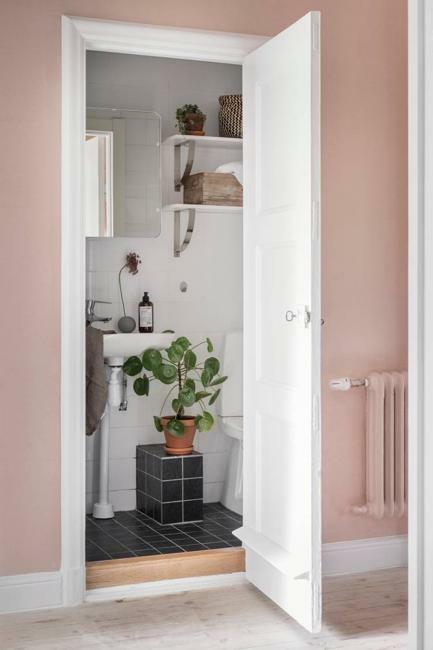 Small rooms, like the bathroom, kitchen, and entryway show the bright color scheme of pink and white. Functional and neat, the interior design looks light, inviting, and cozy. 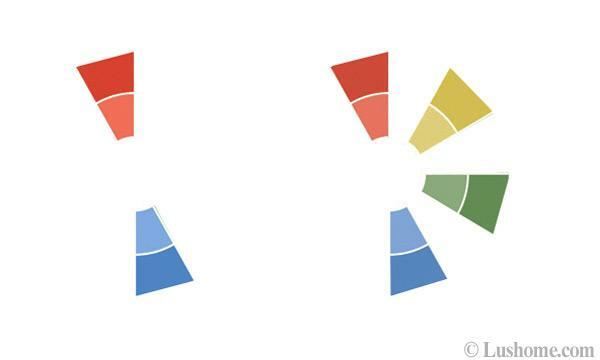 Two main colors play with design and decorating. Neutral color tones of wooden furniture and upholstery create a peaceful atmosphere. Warm accessories in pink and pale yellow, a throw, flowers, and small decorations, support the complementing color scheme. 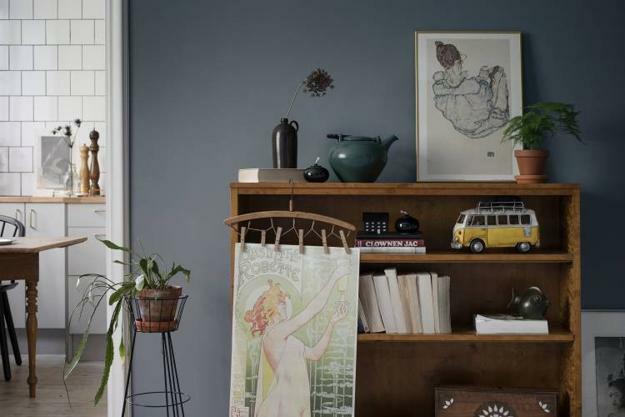 Grayish blue and peach color are an excellent mix for creating a balance between warm and cool room colors. The interior design color scheme looks harmonious and attractive while offering a fresh and stylish way to personalize home interiors.